The Indian River School District in Florida serves over 18,000 students in 27 schools. District officials recently sought a way to integrate their existing classroom AV technology to make it easier to use and support. Extron PoleVault and VoiceLift Systems provided all of the capabilities they were seeking and a few additional benefits and capabilities they weren’t expecting. Once teachers found out how easy the Extron AV system was to operate, it became an essential component for classroom instruction. 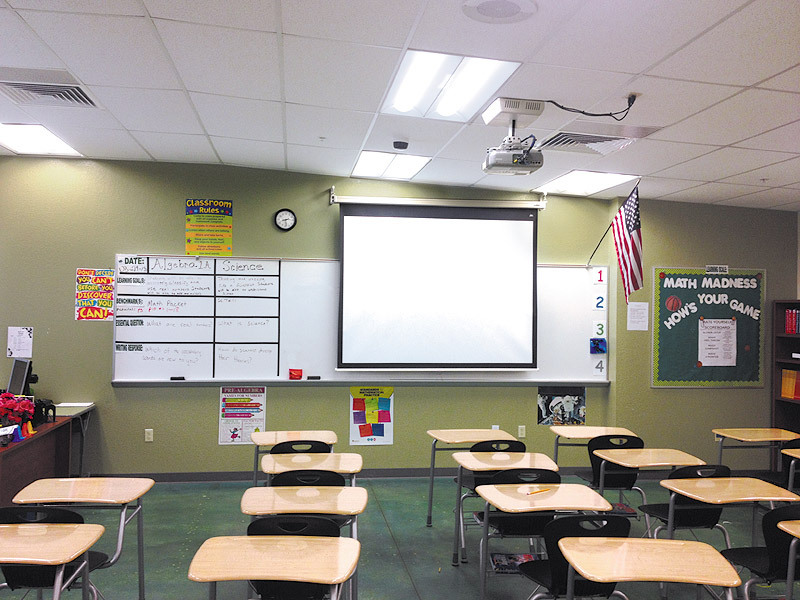 The district began by outfitting their classrooms with projectors and voice amplification systems. However, the original components were not integrated well, which made training difficult and left teachers a little uncertain about using the technology. In addition, the district wanted to replace their overhead projectors with document cameras, improve audio in the classroom, and securely mount the equipment to prevent tampering and theft. On top of everything else, the technology had to be both teacher and student friendly. School officials received a grant for one complete system through the Extron Classroom AV Grant Program. This enabled teachers and students to experience the new technology first hand and to explore ways in which the AV technology might enhance learning in the classroom. After reviewing various companies and technologies, the district selected the Extron PoleVault System with VoiceLift Microphone for the classrooms. The PoleVault System integrates all of the AV components, and features an easy-to-use wall-mounted control interface. One unique issue faced by the district was the need to integrate with an assistive listening system, or ALS, in certain classrooms. With the existing system, the teacher wore a microphone and transmitter that was compatible with the receiver built into student hearing aids. Teachers and district officials knew it would be cumbersome for the teacher to wear the VoiceLift Microphone and the ALS microphone/transmitter together. Fortunately, the PoleVault System could be configured to support VoiceLift and ALS functionality from a single microphone. “The Extron system completely integrated the teacher’s voice and program audio with our assistive listening system, which benefits all students,” says Mary Grace Hektner, Speech Language Pathologist at Indian River Schools. With PoleVault Systems, critical AV equipment is mounted securely above the projector.